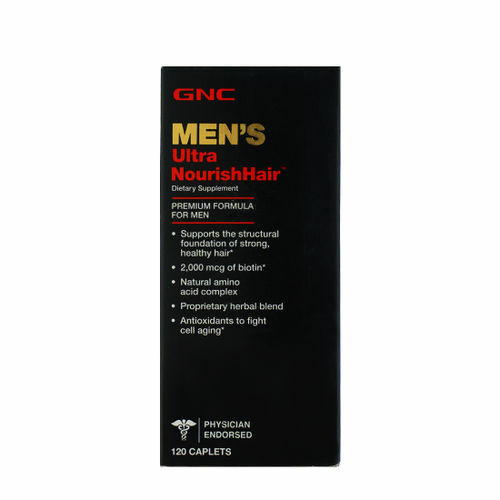 GNC Ultra Nourish Hair is a specialty nutritional formula scientifically designed to nourish hair from within. This enhanced formula blends amino acids with important nutrients found in the matrix of hair. Features 2,000 mcg of biotin per serving to support normal cell growth in the hair matrix. Biotin is an essential vitamin known to promote healthy hair and normal cell growth. Features a natural amino acid complex with Hydrolyzed Gelatine, a natural source of collagen. Includes a proprietary herbal blend that supplies many beneficial herbs such as Juniper Berries and Horsetail. Provides antioxidant nutrients that help protect the body from harmful free radicals that can promote the cell aging process.